Act as a range master when using the ranges and report any violations observed. Follow all rules and Bylaws and behave as a responsible sportsperson at all times, on and off the property. 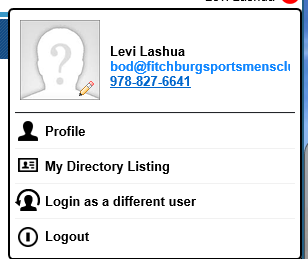 The Fitchburg Sportsmen's Club strives to provide a modern on line interface for our members. All work to keep this club running is done by volunteers. No-one is collecting a paycheck or stipend. Please keep this in mind when you have a concern or issue. In order to stay in contact with our members it is critical that you keep your contact information up to date. This is now easily done on line. Your Member profile can be accessed by logging into our website – Click the member log in link in the upper right hand corner of any page. Once logged in you will see your name in the upper right hand corner instead of the Member Log in Link. 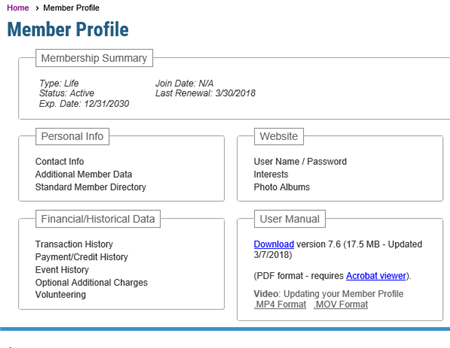 The Membership Summary section is informational only and contains your membership type, and additional data about the status of your membership. Contact info allows you to update your Name, Address, Phone number email etc. Additional member data contains information regarding your membership in Goal and the NRA. This information is collected on new member applications and renewal forms and can be updated by you by accessing it here. Standard member directory – is a new feature of our updated website. By default your information will NOT be shown to other members in the member directory. If you wish to share some or part of your information in the Membership directory you can select what you would like to share here. You can also upload a profile picture. Username/Password – will allow you to change your user name or password. Note: If you forget your password you can call to have it reset. Interests – contains information regarding what committees you have volunteered for or other activities you have previously indicated an interest in. You can update this at any time. This information is used by the club to tailor activities to our members. Photos – is currently not in use. You will be able to view transaction history (renewals etc) as well as any volunteering activities you have signed up for in the past. Currently there will not be any data here, but going forward this section will be useful to track payments etc. You will find more instructions on how to use and update the profile tab including a video tutorial. If you click on your name in the upper right hand corner and select “My Directory Listing” you can see the information you have entered that will be available in the Member Directory. PLEASE NOTE YOU CONTROL WHAT IS SHOWN via the personal Information section under your profile. We feel that the directory may be helpful if you want to find members with similar interests.